Srinagar, Dec 05 (Agencies) Advisor to Governor K Vijay Kumar today said the annual day of Sher-e-Kashmir Institute of Medical Sciences Soura was a day of commemoration, celebration, thanksgiving and patting each other for the creation of such an institute which has played a tremendous role in filling critical healthcare gaps in the State. K Vijay Kumar said this while speaking at the 36th Foundation Day of SKIMS Soura at SKICC here today. He was the Chief Guest on the occasion, while as Advisor to the Governor, B.B Vyas and Advisor to Governor, Kewal Kumar Sharma were guests of honor. Member Parliament, Dr Farooq Abdullah was also present on the occasion. The Advisors were flanked by Director, SKIMS, Dr Omar Javed Shah, Principal, SKIMS Medical College, Srinagar, Prof Riyaz A Untoo, senior doctors including Dr Shariq Masoodi, Dr Raffit Hassan, Dr Fazzal Qadir Parray on the podium. Advisor to the Governor, K Vijay Kumar recalled the contribution of SKIMS founder and former Jammu and Kashmir chief minister, Sheikh Mohammad Abdullah. On technology and medicine, Kumar said that the new inventions and techno-inputs were creating wonders in the field of medicine across the world. Sharing his vast experience of working in various capacities across the country, Advisor Kewal Kumar Sharma, who was guest of honour on the occasion, said that there were different models of hospital administrations and the model (Governing Body, Autonomy) through which the SKIMS runs was the best modal. Sharma said that by giving autonomy to institute which is governed and managed by its doctors, the best decisions come out from such health institution. “This governing body and autonomous modal also help in inter-departmental coordination in any health institution,” Sharma said. He emphasized that the overall progress of SKIMS from last 36 years shows that the model with autonomy to the governing body functions very well and leads to the success stories. He congratulated the doctors and other officials for carrying out their professional work and working hard for providing the best possible healthcare to the masses. On the occasion the organizers informed that this year more than one million patients have visited SKIMS OPD, so far. Sharma said that the State government is committed to provide its support to the SKIMS in terms of allocation of funds for procurement of better healthcare equipment and the up-gradation of infrastructure. For the year 2018-2019 the capital allocation for SKIMS is around Rs 26 crore and allocation for SKIMS Medical College Hospital Bemina is around Rs 8 crore. He lauded Principal, SKIMS Medical College for running the institute in a professional way. He also spoke about getting funds for languishing projects and various projects approved for SKIMS. He said SKIMS has been given authorization for the Cath Lab costing around Rs 8 crore under the languishing projects scheme. The authorization has also been given for the construction of drug de-addiction center and procurement of MRI machine at SKIMS Medical College hospital, Bemina which costs around Rs 8 crore each. Sharma said there are various proposals under consideration including Advanced Pediatric Centre with the estimated cost of Rs 123 crore and 100 bedded maternity hospital to be established in SKIMS. He said various initiatives are being looked into for further strengthening the healthcare facilities in SKIMS. Speaking on the occasion, Member Parliament, Dr Farooq Abdullah applauded SKIMS for its contribution as a center of excellence in healthcare. Dr Abdullah while speaking about various researches going around the world in health said that Jammu and Kashmir lack in the field of medical research. He stressed upon the doctors to focus more on research—which would bring them many accolades. He asked them to come up with tangible research which can help in curing certain incurable body ailments. Observing that there is a dire need for the construction of an auditorium at SKIMS, Dr Farooq announced Rs 1 crore from MPLAD for the construction of the same. Director SKIMS, who is also Ex-officio secretary to the Government, Dr Omar Javed Shah in his address paid tributes to its founder and former Directors for their great contribution in making SKIMS a prestigious Institute of the State which serves needy patients who can’t afford the treatment outside the state. He highlighted the activities and achievements of SKIMS and enlisted key projects upgraded and under execution. 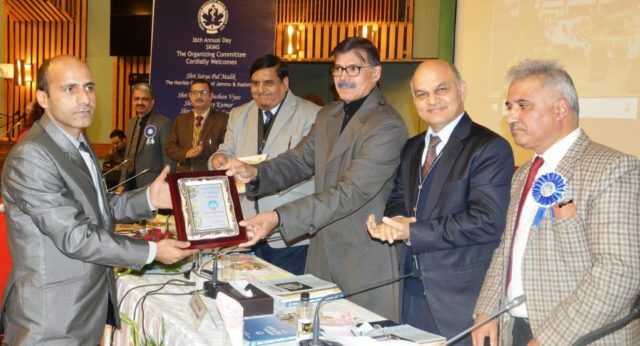 He reiterated his commitment to make SKIMS “center of excellence—saying SKIMS has evolved over the years and brought in diversification in various fields of medicine and surgery and allied. It has gained the trust and faith of the community at large. Earlier, Dr Raffit Hassan Chief, Thoracic and GI Malignancies NCI, NIH USA delivered the Sher-I-Kashmir Oration. Later Kumar along with other Advisors e-inaugurated various key projects of SKIMS which included Burn Ward, OPD Block, Library, Staff road and Gastroenterology lab etc. He also released SKIMS Annual Report, 2018 and SKIMS Insight Magazine and Disaster manual. Pertinently, SKIMS was conceptualized four decades back by visionaries with main objective to tide over the sufferings of common people by providing specialized health care services. Dr. Ali Mohammad Jan proposed the idea of SKIMS to Sher-I-Kashmir Sheikh Mohammad Abdullah, who put all his efforts and made SKIMS a reality which is catering thousands of patients today. The foundation stone was laid in 1978 and SKIMS was officially commissioned on December 5th, 1982. Since then SKIMS has gone beyond delivering the state of art health care in producing skilled manpower including doctors, paramedics and technicians.